The late Gabriela Ngirmang, Mirair of Koror, was instrumental in giving the world its first nuclear-free constitution. As Mirair (leading woman for the eastern side of the state of Koror), Gabriela Ngirmang was the leader of Otil A Beluad (the Anchor of the Land) women’s organisation for 50 years. When she died at the age of 84 in 2007, she had been a central figure among the women elders of her nation, and an inspirational leader for social justice and anti-nuclear activists across the Pacific and globally. Acclaimed as “valiant” at the Pacific Women’s Conference in Guam in 1989 for her successful defense of Palau’s nuclear-free constitution (she said “If another war breaks out all children will perish and that will be the end of all of humanity”), she features in a textbook for students of government as “a woman having political efficacy”. She believed politics was important not just for the powerful few but for everyone. Yet she never claimed to be, or to have done, anything extraordinary. Gabriela believed it was her responsibility to protect and advance the wellbeing of her people. 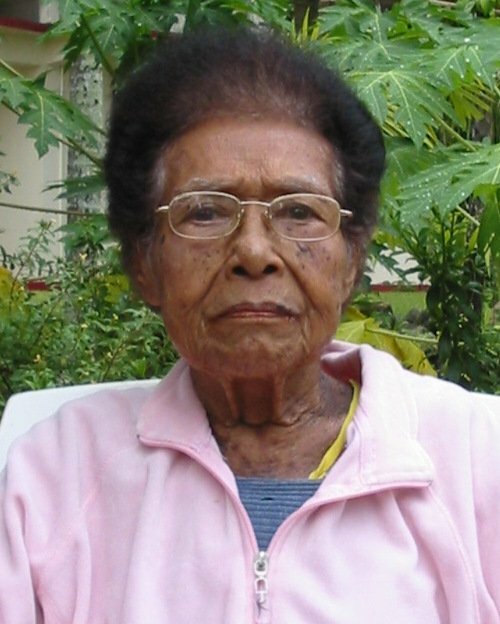 She experienced and survived the Second World War and, because of this experience, she did not want Palauans to experience war again. Aware of the devastation inflicted upon the neighbouring Marshallese from the US nuclear test regime, she knew the dangers of all things nuclear. Her concern motivated her to lead her people to write a nuclear-free clause into their constitution as they moved to reclaim their nation’s independence from the United States. In 1979, 92% of Palauan people voted for their nuclear-free constitution, which included a clause requiring 75% of voters to agree before nuclear weapons could be brought into Palau. This was the first time a clause banning and/or restricting nuclear activities had been included in any nation’s constitution anywhere in the world. This achievement has not been repeated since. Unfortunately, the US had different intentions for Palau. The Pentagon wanted one-third of Palau’s precious land and its deep-water harbour (one of the most beautiful in the world) for military purposes, including for the storage of nuclear weapons. In the 15 years between 1979 and 1994, when Palau stopped being administered by the US (under a United Nations trusteeship) and became the Republic of Palau, the people were forced to vote 11 times to uphold their unique constitutional clause. Each time a new plebiscite was announced, courageous women would travel between villages and islands to talk with communities to provide them with information so that they could make informed decisions about the Compact of Free Association (which defined the post-sovereignty relationship between Palau and the US) and the changes the US wanted made to their constitution. Women had played a major role in the constitution’s development and now they were struggling to ensure their people knew what was at stake if they rejected the protection of its nuclear-free clause. It was grassroots networking at its best, and at its hardest: women talked to women as they worked in their taro patches. Standing up against immense pressure from the US government as well as increasing intimidation and corruption within Palau, Gabriela faced threats to her life and violence against herself and her family. The US spent millions of dollars campaigning for its preferred version of the Compact of Free Association that, once implemented, would grant it military rights to Palauan lands and waters. Both legal and illegal pressure was brought to bear on the Palauan community. This included the assassination of Palau’s president (the first assassination of a president in the Pacific), murder of and physical violence towards pro-constitutional Palauans, and the building of an unnecessarily massive power station by a British company, which bankrupted the nation thus pressuring many Palauans to acquiesce to the US demands. Tension and division within the community came to a head in August-September 1987, when the women elders, led by Gabriela, took their own government to court for attempting to force a vote on the constitution that would require a simple majority to pass, rather than the 75% protective clause in the constitution. Calling on the powers that have traditionally rested with women, 50 women elders from all over the archipelago filed the lawsuit. The Palauan government responded with economic coercion, including turning off the lights and water, and laying-off government workers. An unprecedented reign of terror was unleashed against the plaintiffs and their families. Some of the laid-off workers went to their homes and threatened to kill them if they did not withdraw their lawsuit. Most of these men were drunk. Shots were fired at some of their houses, and Gabriela’s house was firebombed. The terror culminated in the assassination of Rubak (male elder) Bedor Bins by mistake: the killers were targeting his son, Roman Bedor, a prominent lawyer for the pro-constitution lobby. Nothing like this had ever happened in Palau before. Police went to the elders’ houses and made them sign to withdraw their lawsuit. Two women elders then went to the courthouse and withdrew their case. Noting the violence and threats against the women (the courthouse was surrounded by men dressed in camouflage gear bearing guns), the presiding judge said that the case was withdrawn under duress and invited the elders to resubmit the same case when it was safe for them to do so. Gabriela urged others to join her in filing another lawsuit against the Palauan government. In 1988 she travelled to the US Congress and the United Nations to inform them that the case was to be resubmitted, and asked them to give the Palauans time as they were working in a very dangerous situation. The case was taken back to court in 1989 and the Compact was declared null and void. US manoeuvrings continued, and eventually the Palauan government unilaterally amended the constitutional clause from 75% to 50%, so that the Compact the US wanted could be passed with a simple majority. The women elders filed more lawsuits in 1994, but could find no-one in Palau to represent them as it was too dangerous. With few options, they finally hired a lawyer from the US and took their case to Hawaii (away from the imminent danger in Palau), but they were forced to withdraw their case when they felt that the lawyer was not working in their interests. The Compact went through, and in October 1994 Palau was declared independent. Today the US retains control over Palau’s military and foreign affairs, and can take any land it wants with 60 days notice. The US has not yet activated this right, and will face another backlash of Palauan resistance should it attempt to do so. The Compact lasts for 50 years (until 2044), with the financial gains the Palauans were able to secure ceasing in 2010. The Palauan struggle to protect their nuclear-free clause was a real-life case of David and Goliath, as one of the world’s smallest nations stood against the world’s biggest and most powerful. It inspired movements in the Solomons, Fiji and New Zealand that successfully banned nuclear warships from entering their harbours. Gabriela was at the centre of this growing resistance to the militarisation of the seas and the planned use of nuclear weapons. Embodying the values of peace and non-violence, she questioned the colonial, military and nuclear implications of US policy and its impact on Palauans. In 1988 the Palauan women’s organisation Otil A Beluad was nominated for the Nobel Peace Prize and Gabriela herself was nominated for the Nobel Peace Prize in 2005 by the Switzerland-led global “1000 Women for Peace” campaign to draw attention to women peacemakers worldwide. Compiled from an article originally published in Green Left Weekly www.greenleft.org.au. Reproduced with permission. This portrait of Gabriela Ngirmang was first published by the Pacific Community for the 70 Inspiring Women campaign, it is reproduced here with their permission. Palau’s President Tommy E. Remengesau Jr. recently signed and joined few other nations with the United Nations the first convention to prohibit and develop nuclear weapons. Palau continues this work because of the ideals and values of its heritage and traditions reflected on the framework principles of its Constitution driven by the traditional women of Palau like Gabriela and the people Palau that inspires and reminds us to protect our homeland and our planet for the people of Palau and the world. We have a beautiful planet we call home that we must sustain and keep safe for the sake of peace so that all life will thrive in their livelihood now and into a bright and hopeful future. I deeply appreciate this article. It was well researched and it captures perfectly the world I was born into and raised in. Thank you. Now, on to the critical reader that I’ve become: through title is uncomfortable for me to read in two ways. She herself did not make the COFA. If you actually read the clauses (I’m confident you at least read it once), there are many nuances you must acknowledge and understand first before publishing an article with a title that includes the words “nuclear-free” . Please accept my sincere thanks and know that I may use your article as a source in my upcoming coursework.